Disobedience is a like a weed. It’s like the wild morning glory that torments me all summer long. I pull a vine out of a bed of flowers, only to find it sneaking back again two days later. Besides poisoning it, the only way to actually beat it is to dig down into the soil and carefully pull out all of its long, ropey root. The root is the real problem. That nasty white-flowered vine that tries to strangle every other plant it encounters is just the natural outgrowth of the root that’s hiding in the soil. In a similar way, disobedience is not the real problem. It is simply the visible — and unpleasant — manifestation of sin in our children’s hearts. 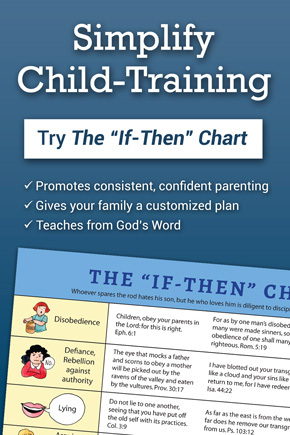 If we only deal with a disobedient child’s outward behavior, we may temporarily “fix” the problem, but the root of sin will send out new shoots and more disobedience. Disobedience is a symptom. It’s what we can see. It’s like the sudden absence of appetite in our normally-always-hungry two-year-old many years ago. That outward symptom, along with lethargy and a low-grade fever, eventually led the doctors to the real problem — the rottenness of an infected appendix that needed to be removed before our little guy could return to his normal mischievous self again. In the same way, our child’s outward disobedience is a symptom of what is wrong inside his heart. His refusal to obey alerts us to the problem, and gives us the opportunity to be used by the Holy Spirit to bring healing and growth. If we only deal with the outward disobedience without addressing the heart, we’re only covering up symptoms, like a doctor who prescribes a painkiller instead of tracing down the cause of his patient’s pain. Instead of becoming the focus of our discipline efforts, our children’s sinful actions and attitudes should help us recognize and seek a cure for the disease and rottenness of sin in their hearts. 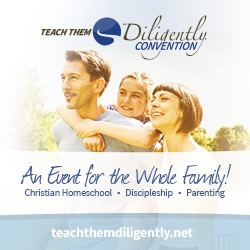 When we see our children habitually disobeying, we need to pray for discernment. Next, we need to confess those sins to our children and repent. We need to ask their forgiveness for our negligence, our own disobedience, our anger, our pride, or whatever other sins the Holy Spirit reveals to us. We need to restore our relationship with them. Then we need to ask the Lord to help us address the root of our children’s rebellion and disobedience. What is nourishing the “weed” of disobedience? What is the outward symptom of disobedience alerting us to in their hearts? That’s what we need to gently uncover and confront. 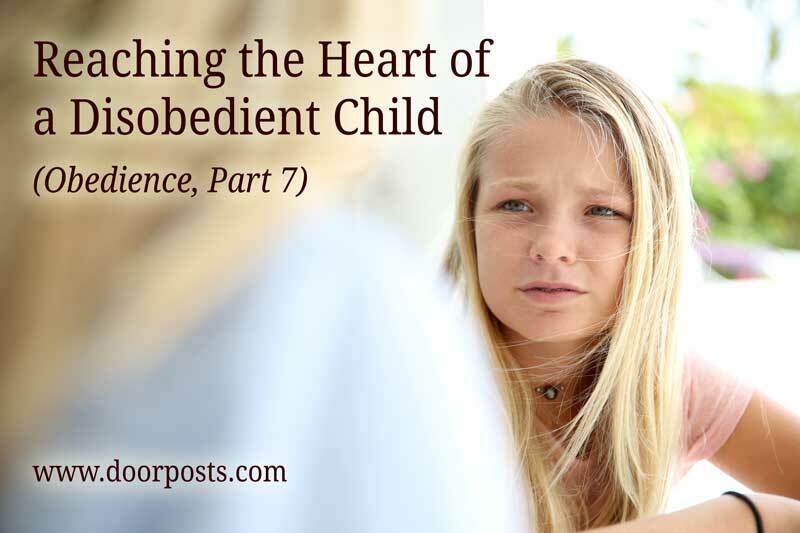 Is disobedience springing from a root of pride in the child’s heart? Does he believe he is better equipped to govern his life than we are, by God’s grace? Is he, by his actions and attitudes, saying that he knows better than God what is good for him? Does he think he deserves a life of ease and self-gratification? Is his disobedience the fruit of fear in his heart? Does he have a hard time trusting God to work out His perfect will through the people and circumstances He has sovereignly placed in his life? Is he afraid he will lose something he values if he submits to you? Is a fear of the opinions of others leading him to rebel? Is a bitter heart manifesting itself in disobedience? 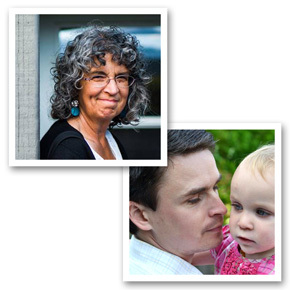 Do resentment and anger — against you, God, or others — lead the child to openly rebel? What does God say about these sins? “In the pride of his face the wicked does not seek him; all his thoughts are, “There is no God” (Psa 10:4, ESV). The proud man doesn’t seek God. He doesn’t think he needs Him. When we or our children disobey, we’re saying we don’t need God. In fact, He and His delegated authorities are getting in the way of what we want. “There is no fear in love, but perfect love casts out fear. For fear has to do with punishment, and whoever fears has not been perfected in love” (1John 4:18, ESV). A true love for Jesus gives us confidence. We can trust Him; He loves us enough to die for us. When we place our faith in Him, we become joint heirs with Him. All that He is and has is ours. We don’t need to fear the consequences of obeying those He has placed over us. The opinion of others loses its grip on us. “See to it that no one fails to obtain the grace of God; that no “root of bitterness” springs up and causes trouble, and by it many become defiled” (Heb. 12:15, ESV). Bitterness is a root that grows when we fail to “obtain the grace of God”. We forget what Jesus has done for us. We forget that He submitted to His Father, that He suffered at the hands of sinful man, and that He died to give us new life and the power to forgive others. Every time our children disobey, we have an opportunity to take them and their fallen hearts to the cross. At the root of their disobedience is a failure to embrace the gospel, a failure to humble themselves before the great and loving God who loves us and gave His only Son in order to save us and make us new creatures in Him. Disobedience is a failure to respond to His gracious forgiveness with the same sort of forgiveness of others, and a failure to avail themselves of the grace and power that makes us new creatures in Christ. When our children disobey, we need to take them to Jesus. We need to lovingly soak them in the gospel, helping them understand how much they are loved, how secure they are in that love, how fully they can trust the God who loved them enough to give His only Son to save them. Then we need to step back and let the Holy Spirit do His work in their hearts. I have a mentally handicapped 28 yr old daughter that has lied a lot lately & caused a lot of problems–she has faked seizures, said she was raped & just yesterday told her councilor that her boyfriend said he was going to kill himself when she told him she wanted to break up with him. The councilor called the guy’s family & sent the police to check on him & today admitted that he told her that months ago not yesterday. The councilor told me she doesn’t know what we need to do & is going to talk to someone who has more knowledge then she does. I’m @ my wits end. I have no family with in 200 miles & I keep to myself so I have no friends to help me. My husband works off & when I tell him what is going on he tell me to handle it. The last 2 yrs it has been one thing after the other. I’m sick of all the drama. I’m trying to work, take care of the house & 3 acres yd plus deal with all the drama she keeps going on. She does go to a adult daycare program but they don’t know what to do either. Thanks for listening & any advice will be helpful.